Join us on a wonderful break visiting Wollaton Hall, Gardens and Deer Park, the stunning locale filmed in the globally acclaimed Batman movie The Dark Knight Rises, the tranquillity of the Trent River Cruise and the majesty of the East Midland’s breathtaking countryside aboard the Ecclesbourne Valley Railway. Sunday 12th: We head east stopping at Melton Mowbray home of the eponymous pork pie and one of the homes of Stilton cheese. We have time for lunch before continuing to Nottingham and check-in at the Mercure Hotel. 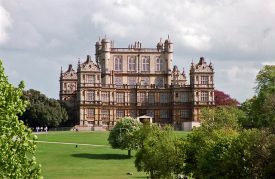 Monday 13th: What better way to get acquainted with the grand offerings of Nottingham than with a visit to the grand Wollaton Hall, Gardens and Deer Park. Stroll around the historic lake, relax in the immaculately kept formal flower gardens. We top the day off with Trent River Cruises. We cruise the beautiful River Trent, one of the major rivers of England. Emerging from its source in Staffordshire, roll gently along the scenic waters as it flows to the River Ouse at Trent Falls. Travel under The Lady Bay Bridge, past the Victoria War Memorial and the stunning Humber Estuary along Victoria Embankment before turning at the stunning Wilford Church and then travelling downstream past TS Orion. knowledgeable group of volunteers. Today we also include a light lunch in a wonderful converted Pullman carriage at Wirksworth Station. After our visit we make our way homeward. Located in the fashionable Lace Market area, right in the heart of Nottingham's city centre, this contemporary boutique hotel offers well-appointed bedrooms, a gym, a trendy bar and restaurant. The hotel is minutes away from the Old Market Square and Nottingham Castle. Dating back to 1822, luxury soft furnishings alongside the finest points of Georgian architecture and a rich history.